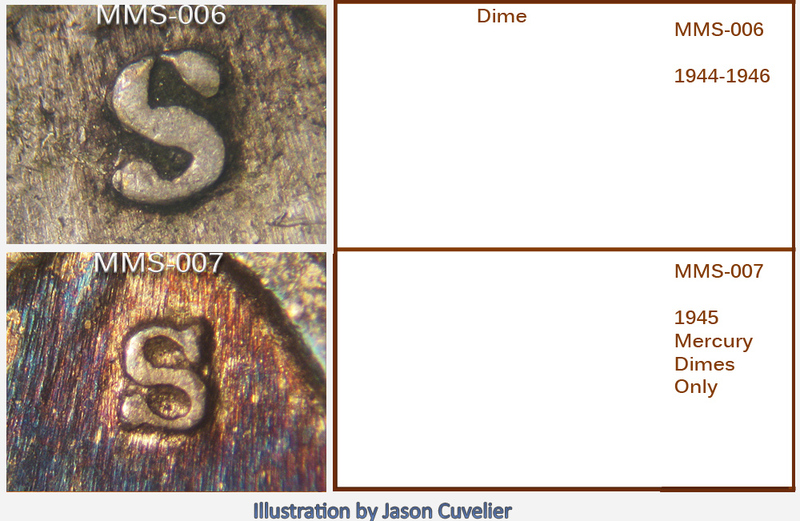 San Francisco mintmark styles (MMS) from 1909-2013 on the Lincoln cent. Largely based off of Dr. Wiles study of mintmarks located HERE. I tried to include shots of either shallow or more deeply punched examples if the MM started to look different as a result. I also included a few shots of an aged example if needed. MMs shot to scale to one another. Here is the so called Micro S only used on the 1945S Mercury dime. I have it sized with a MMS-006 ball serif for comparison (though my example is circulated and a tad bit larger and flatter). Wiles has it as MMS-007 – but only for mercury dimes. I know of no other use of this mintmark. I’m adding it for reference only. This micro S is similar to the size and style of MMS-001 used decades earlier. Here is a scale version of the gigantic S MMS-003 only used on silver Jefferson nickels from 1942-1945. The version on the left is too scale to all the others within the thread. Too large for my earlier formatting.